Media invites have been sent out for an Apple event at 10 a.m. on September 12. 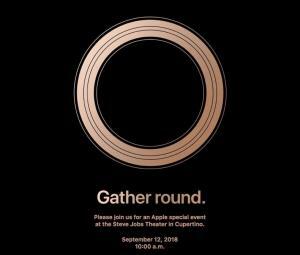 Apple is expected to at least announce new iPhones at this event. Rumors has Apple coming out with three new iPhones this fall, a second-generation iPhone X, a larger-screen iPhone X and a lower-cost iPhone as well. It is also likely that Apple will announce a new Apple Watch model with a larger display. New Macs are also expected this fall, but Apple may hold off and announce those at a separate Mac-orientated event later in the month or in October. Gary, do you have any info about whether there will be a new iPad Pro this year? I’m in the market for a new one, but don’t want to buy one if a new one is coming out in the next couple of months. Your guess is an informed guess. Thank you. Connie: I don’t have any real information either way. But the rumors sites seem to think that a new iPad Pro may come out by the end of the year. You alluded to a new low cost iPhone, although I find that difficult to believe, even in my love affirm with Apple but my iPhone 7plus is on it’s last leg so a new low cost iPhone sounds like just what I need, any clues to it? if there are I am sure you will pass it on to your faithful. joseph: I’m sure we are reading the same rumor sites. I don’t have any info beyond that. We only have a few days to wait now anyway.